Description: Shrub 3–4 m high. Leaves oblong to oblanceolate, 2–5 cm long, 5–15 mm wide, flat or with slightly recurved margins, upper surface glabrous and often viscid, lower surface paler or whitish; tapering into petiole c. 3 mm long. Male flowers 2 or 3 together; sepals c. 4 mm long; stamens numerous, short. 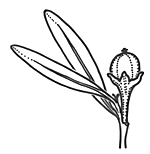 Female flowers solitary; sepals 2–3 mm long; ovary nearly globose, stigma large, sessile. Capsule glabrous or sparsely pubescent, viscid, 6–8 mm long with persistent stigma c. 2 mm wide. Distribution and occurrence: Widespread in skeletal soils on ridges and hilltops or in crevices of rock slabs and on steep bluffs.